And in his R.O.I. column WSJ’s Brett Arends makes a similar argument. He looks at the data on housing starts since 1972, which shows that new housing starts slumped below the one million mark in March. Every time that has happened in the last 50 years, Mr. Arends writes, it proved to be the bottom of a recession. To be sure, as Mr. Arends points out, there is no guarantee that this downturn will follow the patterns of the past. And he notes that prices in many areas are far from a historic bargain. And where there is a glut, prices — obviously — are likely to stay lower for longer. But in many areas, prices are low and buyers may be tempted. Some housing in some metro areas may be more affordable than in decades earlier, but they are still expensive. Go with he analysts who belive that housig prices for existinbg homes will decline, on average, about another 8 or 9 percent this year. 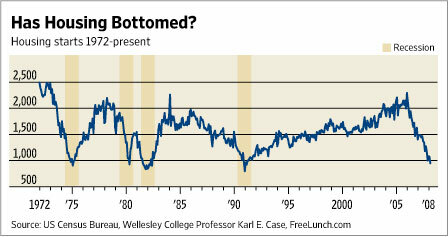 The elusive “bottom” may appear late in ‘09 for most markets. Home prices are higher for Q1 2008 vs. Q1 2007 for Birmingham, Huntsville, and Mobile, Alabama. While sales are not at the levels of 2006 and 2007, both of those years were record years for home sales in the state. The unemployment rate is 4.1% for the state. The state is projected to have significant economic growth in 2008 regardless of what happens to the national economy. What housing crisis? I still fear that this time around, too many homes/condos were built / bought as second homes / investment properties to flip, so as the price multiples to incomes are still very high in some areas, there is still too much room on the downside. Thus, I agree with the above Blogger, another year of price reductions are in order, next year will be bottom fishing time in FL, NV, with CA maybe pushing into 2010. I’ve seen a number of other pundits and people in real estate get constantly burned by using the same type of logic – “it’s as bad as it was the last time real estate was in a bear market, therefore it must improve.” These types of arguments were popping up as early as in 2007. It is good to be aware of history, but there is no way you can think things will be the same this time considering the run-up was much larger than ever before, and we’ve already set records in foreclosures and are seeing record lows in sales (even though there are far more homes and people than before). It is – unfortunately – truly a new paradigm. It was an unprecedented bull market, so now we’re facing what appears to be an unprecedented correction. Homes most definitly are not affordable here in central & northern New Jersey, just ask anybody under the age of 30 that isn’t married. Nobody here stands a chance of being able to afford a home in an area where they won’t have to fear being shot or robbed. Combine the already high home prices the absolutly staggering property taxes, and New Jersey may be the most unaffordable place in the country, including California. In Eastern Massachusetts you find that a 1950s style cramped, never updated 3 bed 1.5 bath cape, 1,400 sq ft house without a garage is still $400K (down from $450K a few years ago)… and you know it’s still way overpriced. Housing has a ways to fall here before it is priced at an affordable to income level. I would say that it’s likely prices will decline here another 10% before they stagnate at that reduced yet very high price for 3 to 5 years. I would not buy a doghouse in the MA market at this point. Prices have another 15-20% to fall in overbuilt former investror ridden bubble markets such as California, Nevada and Florida. The worst will be over by 1/1/2010. It’s ain’t over until the fat lady sings. The fat lady being debt-ladden US consumer. I believe any- and everyone with a pulse already “purchased” ARM-financed home back in the boom days. So, my question is, who are these “notional” buyers tasked with Herculean effort to buy all of this inventory? The graph of housing starts left out the recession from the fourth quarter 2001. One more factor to consider: not only is there an historic inventory overhang but the type of houses in inventory are not what the market demands going forward. A good analogy is the car dealer stuck with too many SUVs and light trucks on the lot. They will eventually sell but only after aggressive price reductions. Case-Shiller who has proven to be one of the most reliable sources of housing crisis information predicts an additional double digit decline nationwide. The fat lady will celebrate another birthday before she sings. 1. I agree with NJ, young people and most singles still can’t afford to buy. 2. Homes under contract just dropped again last mth., according to the Nat’l Assoc. of Realtors. 3. Mortgage rates are low, but it’s significantly harder to get a mtg. 4. People aren’t buying. They’re afriad they’ll buy and prices will keep dropping. They’re afraid the economy will worsen even more and they’ll lose the house. They’re just plain afraid to commit. I don’t think it will change until after the election, more likely Jan. ‘09, when and if we actually have a transfer of power and a new president. More people are afraid that won’t happen then will admit. I believe it is time to nimble in areas that are most likely to rebound. These areas are more affordable now. Your offering price should also discount an additional 5% decline in the market if you are wrong. On the long run, you will turn out fine if you have a 10-15 years horizon. Maybe. Still a risk. I do think the 10-15 year time horizon is correct. To me why risk losing 1%/month on your purchase price when it’s guaranteed that if the bottom has been reached it will stay at the bottom for some years anyhow. I would wait for another year and then pitch the 5% discount… and when you do, give the seller 24 hours to reply and then move on to the next house. The inventory will still be strong for years to come. No need to fall in love with a loser of a house. Look, we have “alternative reality” lurking around spinning his doom and gloom. Ok, I have been known to be gloomy. Tell you what… next time you make an offer on a house, give the seller 36 hours, but give it to the seller at 9PM at night so the seller will have 2 sleepless nights as they mull selling at a realistic price. Not tempted at all. Signed on for another year’s lease in fact. Maybe we’ll look next year, but more likely in 2010. With credit tightening everywhere and people overextended, and more ARM resets to come, I like my odds. Does anyone really think that prices will suddenly shoot up? Come on. Hank: Valid point and the only reason prices have not fallen further. The $285/sq ft is more in the postage stamp sized lot land value and not the construction. For economic reasons prices will fall another 10% and not replacement cost. Note, few new houses are being built in MA to speak of and none in built up towns like the one I am referring to so there are no construction comps. Houses like these are pure junk… Professor Shiller often referred to Boston area housing as “junk housing”. When the market was strong it was not unusual for one of these houses to be on the market with its original 1950 roof and seller would list it as an “original fixture” as if it increased the value somehow. I believe anything in the past has nothing to do with now and going forward (future). We have never in the History of US immigrations seen Nationals from India, China, and Japan migrating back to their homeland. This can attributed to the GDP of these developing nations. So, I would say hang on buyers.. until the real estate normalizes. What, are houses going to disappear? I have my down payment fund/cash reserve, nothing can happen to me with subprime. If the gov’t does ‘rescue’ us, we’ll all be worse off. So help me I will have to hide Barney Frank in a cave somewhere if he keeps up with his stupid ideas, like allowing judges to rewrite mortgage contracts. Just let the (free)market adjust and be done with it. Indy: Need I say more than my tagline? You’ll never time the bottom and if you think it’s going to be Q1/09, you can keep paying rent without enjoying any interest write-off for the next 9 months, or you can make a fair & reasonable offer for that place on which you’ve had your eyes set. Wait too long and it will be gone! This is incorrect, it is very easy to get a mortgage today. Just like it was in past decades. You just need to have saved 20 to 30% of the cost of the house in question, have a stable job and a stable history in making purchases and repayments. The stupidity of the last 7 years when GREED was “get the fees” in mortgage writing is over and the usual specifications for qualifying for a mortgage are back in vogue. David: “Wait too long and it will be gone?” Let me guess: realtor? I prefer to rent my house that would cost double my rent in mortgage if I bought it, and I now have money in the bank that I would have to spend for down payment. Forget the interest write-off…what about taxes and maintenance? Then, if I had to sell in the next five years, I wouldn’t have even put a dent in my principal because all my payments went to interest. Please…renting makes so much more sense in most situations now, even for those who plan to stay put. If that was directed at me David, you can save your breath. By the time I factor in the actual tax benefit (in NY the standard deduction is pretty high), the foregone interest on the down payment, the carrying costs of a place comparable to our rented apartment – renting wins very easily. It’s only over a long term it makes any sense to buy, and we aren’t particularly set on a long term home yet. The question is if interest rates hit bottom and can only go up then that means asset values must continue to fall. The politicians and political spin machines prey on uneducated people who know no better. Here is the way things will unfold and listen up. 1. interest rates will bottom when inflation starts getting out of check… oh wait, it is already out of check. 2. if u increase interest rates to stop inflation, then you have asset values plummet and yes a house is most certainly an asset. 3. the fed cut rates and house prices still deflated… (see jack-sses, most of these wsj writers been reading my emails to them for the last 4-5 years saying that our economy was headed for a liquidity trap… guess what? it has arrived!!!! If you people really want to know if it has bottomed, then the answer is simple —- no it has not. here are a few more reasons why. 1. avg. income is what $35k a year and the ave house is $200k a year. what is missing here Jacklegs? oh, yeah that means that most people can’t afford $200k house. 2. bank’s balance sheet in clean up mode for the next 5-7 years.. oh yeah, that is right. that means that banks will not lend as freely… so lets get FHA and the federal department (via taxpayers) to back it up. (that is a joke – privatize profits and socialize loses). so much for that whole capitalistic bull the politicians feed us. 3. have you seen statistics on credit scores of consumers? holly sh-t!!!!!!!!!!! if u have not, then don’t look because it will scare you. like i said all u jacklegs r nutz — except OZ. This entry was posted on May 13, 2008 at 2:34 am	and is filed under Current News, Real Estate. You can follow any responses to this entry through the RSS 2.0 feed. You can leave a response, or trackback from your own site. Finding a professional Monticello Realtor in Illinois is thebest way to find the perfect property or home.